You're a student, you live in the UK, so there's not much risk you'll end up in the gulag if you and your mates spread the word, right? Wrong. Your best bet is to get a patent on the design, so people can't copy it without paying you a royalty, surely. That's what the usual books on entrepreneurial protocol would advise. Yep - and they're wrong too. What actually happens is the Ministry of Defence preview the patent application, decide on a whim that your lash-up is a threat to the Defence of the Realm, and under section 22 of the UK Patents Act they not only indefinitely prohibit publication or exploitation of the invention, but threaten you and your sidekicks and theirs with years in jail and kilopound fines if you spill the beans. 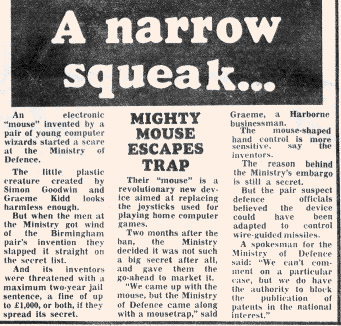 Our rebellious response to this was to rope in all the media we could muster including local press, radio, ITV and BBC contacts, generating an entertaining high-production value TV documentary about 'the mouse that scared the ministry', an official climb-down and (in due course) UK and European patents. But we felt the situation was ridiculous, funny and scandalous, and we had little to lose. While it's not a strategy we'd urge upon others, it adds up to a cautionary and instructive tale which deserves an audience, whether or not you're a budding inventor or intellectual property maven. The story begins in 1983 when the standard home computer input device was a keyboard with between 40 and 60 switches, often augmented by optional digital joystick inputs which typically added four directional inputs and a 'fire' button via a 9 pin D-type connector. These appeared on Atari and Commodore computers made in the USA at the start of the 80s, and other companies soon piled in with alternative joystick controllers which were easier to use, more robust or precise, or came with extra buttons, knobs and features like 'autofire' to improve their ergonomics. In those days, before the introduction of Apple's Macintosh, let alone Microsoft's first embarrassing attempts at Windows for PCs, the WIMP desktop concept of computer control via Windows, Icons, Mice and Pointers pioneered at Xerox Palo Alto Research Centre in California was becoming known to home computer pioneers, but the input hardware was essentially unattainable. 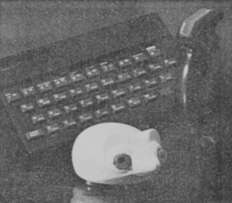 Keyboards and joysticks ruled, and add-on joystick interfaces for the mass-market British home Computers like the ZX Spectrum were popular accessories, aimed mainly at game-players but also useful controllers for early art and graphic design software, or to control the entry point in word-processing and spreadsheet programs. The hardware and software needed to connect a digital joystick to a computer expecting a keyboard switch array is pretty trivial, involving little more than wiring one set of switches in parallel with another, choosing those to give maximum compatibility with existing software (e.g. mapping to digit or arrow keys). As a keen and prolific hardware hacker and UK magazine columnist I boiled up several such interfaces in the early 80s, including Genial Joysticks  for Digital and Micro Electronics, aimed at users of the 'Video Genie' microcomputer, a Hong Kong clone of Tandy's seminal TRS-80, and Interface Zero  for Your Spectrum magazine. 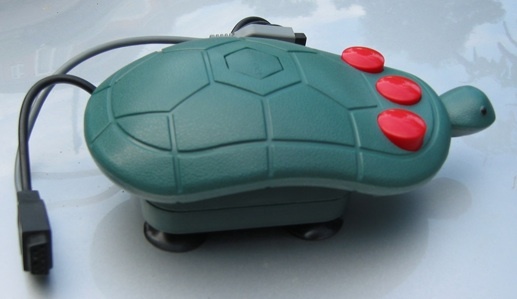 Almost as an afterthought the D&ME article included a design for a joystick alternative superficially similar to a mouse but with the same simple interface as a digital joystick. You used it on any convenient flat surface, like a mouse, but by rocking rather than rolling it round to indicate the desired direction of pointer movement. 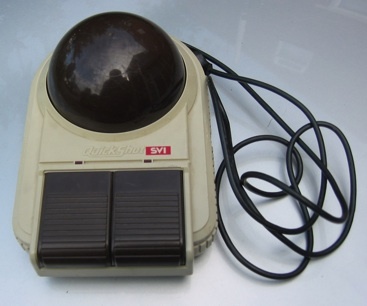 A real mouse or trackball requires quadrature sensors and a far more complicated pulse-counting circuit which was not available in a typical joystick interface in those days, when logically-equivalent trackballs cost several times more than joysticks and wheel or ball-based mice were almost unobtainable. My mouse-lookalike addressed some of the ergonomic flaws of digital joysticks, including the risk of Repetitive Strain Injury (RSI, then known to the media as 'joystick claw') prevalent when the joystick was stripped of its arcade cabinet base leaving the player wresting with one hand on the base and the other clutching the shaft of a cheap and imprecise lever or bubble-switch based stick. In the course of the decade these flaws were alleviated, at least at the high end of the market, by better switches - such as the positive, clicking microswitches in Konix sticks - improved shaft and base designs, rubber feet and suckers. But back in 1983 the base-less 'digital mouse' design still had an ergonomic edge as well as fashionably innovative styling. My 'Genial Joystick' article was written on the computer it customised during my second undergraduate year at Aston University and appeared in the Autumn 1983 issue of the UK quarterly news-stand magazine Digital and Micro Electronics. The text and illustrations are now preserved on Knut Roll-Lund's Video Genie website . 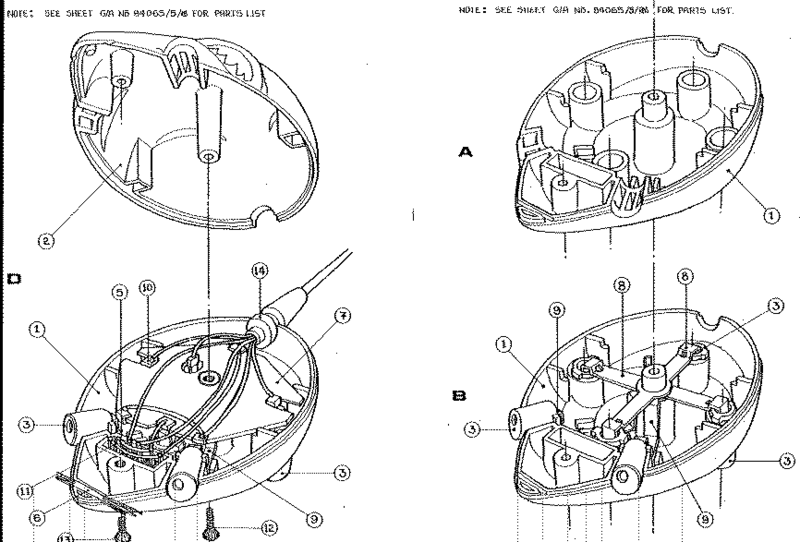 The magazine's Figure 4 shows the genesis of my 'digital mouse' idea. The original was made using a small aluminium box and five momentary-action push-switches. 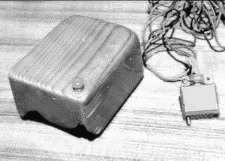 It worked but was not particularly ergonomic - though most mice in those days, including Doug Engelbart's wooden prototype, were rectangular boxes rather than the curvy mouldings of today, it was 'inventor art' in styling. Apart from the fire button and (rather important) pivot or 'fulcrum' in the middle it was reminiscent of a DIY Joystick design published years before by David Annal, in the September 1979 issue of Practical Computing magazine, though I'm not sure if I saw that article when it came out. The button on Doug's device (left) looks identical to my first attempt, though his had wheels rather than more buttons underneath, a far more elaborate interface, woodwork beyond my mechanical abilities, and doubtless worked a lot better. 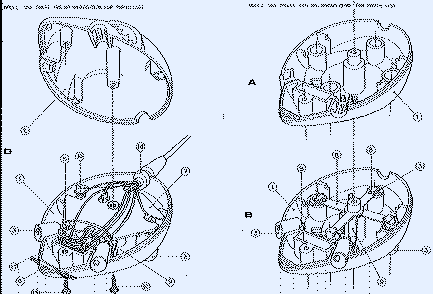 Anyhow, concept proven, I soon pulled Figure 4 apart to re-use the bits for other things, as any impecunious inventor might. Almost every inventor needs a patron, some combination admirer, would-be exploiter and Svengali who provides motivation and encouragement when an idea worthy of development bubbles up. For much of the 1980s this role was periodically played by my friend Graeme Kidd, whom I met when he was Business Manager of the Aston University paper the Birmingham Sun, as I was elected editor. We collaborated on various micro-related schemes including a Kids' TV Series called Magic Micro Mission, broadcast in six ITV regions, a mail-order computer language translator (the Zip Compiler, selling over 1500 copies at £3.50 a throw through the original offer in Your Spectrum magazine, and thousands more in subsequent releases via Crash and Your Sinclair mags) plus two hardware/software hybrids: a newspaper typesetting system and an budget autocue device for TV studios. These latter were cobbled together from a couple of bottom-of-the-range British home micros - a Dragon 32 and 48K ZX Spectrum - various daisywheels, reams of Z80 and 6809 code, a smattering of ROM BASIC, a linear motor and an Atari paddle controller (for details, please await my hardware hacks page). I never saw any money from those hardware schemes, and doubt if Graeme made much that wasn't promptly deposited at the local pub, despite his regular promises of 'folding money' - I made him a hinged 2p coin as a reminder of this. But I had fun putting those together and learned a lot. The same can be said of the Digital Mouse Project though that lasted a lot longer - seven years in all - burned more cash, thankfully not mine or Graeme's, and put us both under threat of years of jail for our naive attempt to profit from a simple invention while subjects of HM Government. Around Xmas 1983 Graeme got excited about the 'Digital Mouse' concept and persuaded me to rebuild it in a softer case, with an Atari/Commodore/Kempston compatible nine-pin plug rather than the DIN type I'd used on my Video Genie. A second fire button made it suitable for right handers like him as well as lefties like me, and made it more mouse-like as long as you don't quail at the thought of poking a rodent in the 'eyes' for motivation. He added a snout, built around a Bell's whisky bottle-top, and the Mark 2 version was finished with a layer of wooly off-white fur contributed by Graeme's partner Sally Newman. It still worked, and we tried it out on a few ZX Spectrum games. I remained fairly dubious about the commercial potential of this simple arrangement of switches and wires, but Graeme took the prototype along to BIDC, the newly-established Birmingham Innovation Development Centre, which was funded by local government and intended to stimulate regional manufacturing of new products. He came back with a £10,000 grant, repayable after production, which was productively spent on UK and European patents, which I prepared with expert agents Forrester Ketley & Co., splendid prototyping and production engineering work by John D. Vale and his model-making assistant Will. Most of the remainder was sadly wasted on a thick but superficial marketing report prepared at great expense and transparently little effort by business leeches Deloitte Haskins and Sells. Graeme knew John Vale through his social circle in the Harborne suburb of Birmingham, via his son Kim who hung out with our student crowd. Kim's dad John was a capable industrial designer, responsible among other things for production engineering of the Petite range of toy typewriters made by Britains Petite Limited. Year after year John managed to improve the functionality of the toy while reducing the number of plastic mouldings needed to manufacture them, driving down costs. Among other things he'd also invented a kind of steadicam for carrying open wine bottles without risk of spillage. He had elegant offices above his wife Michelle's French restaurant in Hockley, in Birmingham's jewellery quarter. John refined our prototype into something stylish that could be economically manufactured and comfortably, reliably used, while I tightened the patent, learning interesting things like if you propose a device with 'four legs' your claim should ideally call for 'preferably more than one leg' in order to be drawn as widely as possible. The product shape was developed through clay and wooden models and then implemented as a working pre-production unit of plastic and metal. Various colour-schemes were tried. The most exciting and unexpectedly effective was glossy black with bright red feet and 'eye' buttons at the front. This became unexpectedly useful when I took it round to show friends in Saltley - as I took this fierce-looking caricature of a giant mouse from my bag their normally domineering cat leapt up from the sofa and shot out of the room, apparently terrified. We hatched a plan to take advantage of this spin-off effect. Said cat was a very determined fridge-burglar, able to prise open the door of my friends' refrigerator and steal food from therein even when the door was heavily wedged shut. He had been found braced between the skirting-board and a full metal toolbox pressed against the fridge door and intended to hold it shut, patiently levering the box away to gain access to food intended for others. This annoyingly competitive behaviour was curtailed that night by placing the glaring mouse prototype under the lamp in the main compartment of the fridge, and leaving the door unguarded so the cat could gain prompt access. Which he did. But when he saw the scary monster sitting there the cat panicked again and ran out of the house, deciding not to risk further incursions since such a scary beast had taken up residence. Perhaps we should have taken the hint and redirected out marketing into the less technically-demanding area of feline fridge defence. But we plugged on with the original concept. Soon after the patent  was submitted, long before publication, the story turned very strange, in a fashion that you will not find explained in books for entrepreneurs and inventors but which they should bear in mind, especially if UK-based - though I expect similar traps exist in other countries. One morning Graeme and I received threatening letters informing us that the British Ministry of Defence had intercepted our application and determined, under the powers vested in them by section 22 of the UK Parliament's Patents' Act, that publication of our patent application would be 'prejudicial to the defence of the realm'! I was already familiar with some such rules, having worked at Racal Redac where we were prohibited from exporting some of our Computer Aided Design systems to Eastern-block countries unless they ran on ancient computers with magnetic core memory. Under the same COCOM regulations Sinclair's famously erratic Microdrive tapes were labelled 'munitions' and banned from export because the packing of data bits on their thin tape spool, propelled and read with cheap cassette-recorder parts, was determined to be higher than the maximum density permitted for old-style computer tape spools of the type seen uselessly spinning in the HQs of James Bond's evil enemies. In this case the ban was more comprehensive. We were prohibited from telling anyone about our mouse, or 'command signalling device' as Forrester Ketley & Co. had generically but in retrospect perhaps provocatively titled it, on pain of two years imprisonment - the same punishment now reserved for policemen who sell state secrets, among others - and a thousand pound fine. We were required to immediately provide a list of anyone else we'd mentioned the invention to, so they could be similarly threatened and punished if necessary. Knowing that the invention was a rodent-styled passive arrangement of seven standard switches and sixteen wires, this seemed to us an over-reaction, to put it mildly. It appeared likely, and our agents concurred, that the faceless bureaucrats at the MoD Inventions Unit had decided to shoot first and answer questions later, if at all. Given instructions and unbounded power to ban inventions that might be of use to an enemy, they'd probably got no further than the title before deciding that our little mouse might as well join the collection of secret knobs, handles, yokes, joysticks and trackballs already used to guide missiles and other killing machines in the cause of keeping the Cold War on the boil. 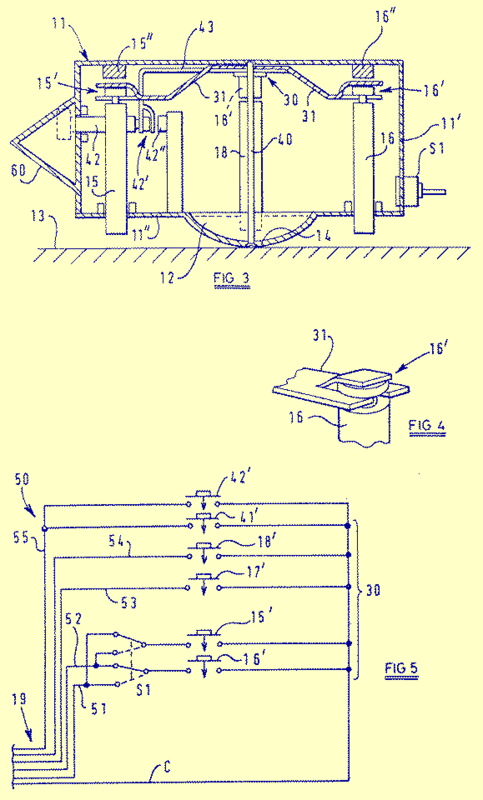 If you have a couple of years to spare and a few grand you might find it instructive to draft patents with 'interesting' titles - Hypodermic Quark Bomb or, more subtly, Fast Order(n) factorisation of prime products and see what happens when you submit them. The content is unlikely to matter much. It's possible that the MoD Inventions Unit has found bigger fish to fry, or (more likely) been outsourced to the USA (in which case the alternate spelling 'factorization' might be required to trip the trap) but I suspect any sincere inventor with no plans to threaten the realm but a reasonable fear of miscategorisation might be better off filing their first application in some other EU country, preferably one which is not a member of NATO. "Under the Patents Act 2004, it is now only necessary to file an application for a patent first with the UK Patent Office, or obtain written permission to file overseas, if the invention relates to military technology or contains information the publication of which might be prejudicial to national security or the safety of the public. It becomes a matter for the applicant and his or her agent to consider". Quite how we decide what might be prejudicial to national security or safety, given my experience, is an unresolved puzzle. There is no statutory right of appeal to such a ban and we were advised to raise our objections under the cloak of secrecy and hope the MoD would see sense in their own sweet time. Meanwhile we should do nothing to develop the mouse further into a product. We felt this was unreasonable. After discussion we decided to call the Ministry's bluff and approached local TV station Central ITV with this splendid story. The result was a documentary feature in their business magazine series Venture , presented by John McLeod in the role of a spy stealing our simple secret, with interviews and a little acting by the inventors. This was easier to pull off than it might seem since we'd both worked for Central News, as devisors and contractors on the 1983 Kids' TV series Magic Micro Mission and in Graeme's case as copytaker on the regional evening news bulletin. We had plenty of contacts there, from reporters and editors, through the press office, to Controller of News and Current Affairs Terry Johnston, who had borrowed my ZX Spectrum the year before while getting to grips with the new world of microcomputers. They were quite ready to believe in us as inventors - indeed local inventions were an ATV and Central ITV staple - and could see how absurd, newsworthy and indefensible the patent proscription was. 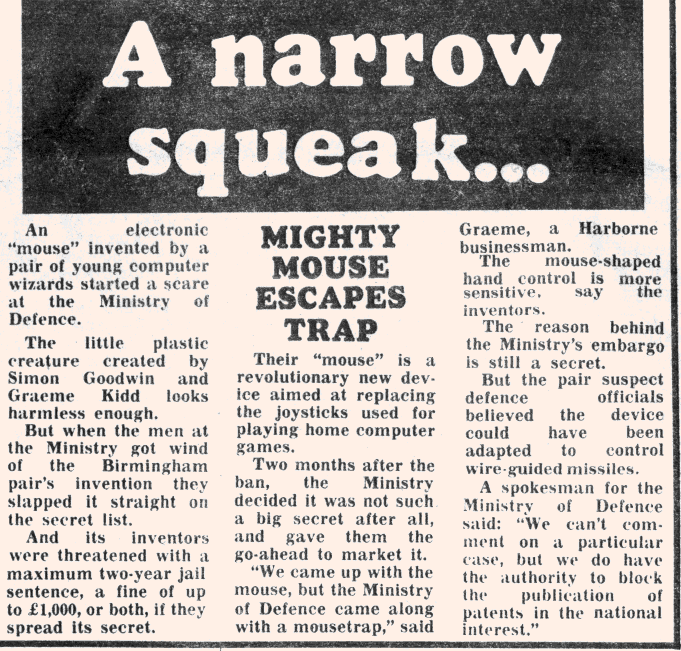 The result was Central Television production number 4551/84, billed in the TV Times as "This week: a Birmingham inventor whose plans for a 'digital mouse' were embargoed by the Ministry of Defence." Since Graeme's Harborne squat did not present the required 'respectable businessmen' image (though ideal for a later programme on hacking when the hacker's home was deemed inappropriately cosy) we borrowed John Vale's elegant design studio in Hockley where there were already plenty of the secret documents and hardware, augmenting those with some Equity white mice scuttling around on carpetcam. Graeme and I pretended to be packing up after a hard day's inventing while reporter John McLeod crept furtively up Warstone Lane in a long mac, equipped with Soviet-era spy-cam and plans to 'break in', trailed by the massive TV crew typical of those 'licence to print money' days, shooting footage with 'day for night' filters to give the impression that this was an overnight burglary without incurring extra union negotiations. A splendid time was had by all. Between the time of this filming and the documentary broadcast, trailed twice on Central News, the Ministry Inventions Unit found itself deluged by unexpected and unwelcome press enquiries - from Central and also from the BBC, local radio station BRMB (then with a fully-equipped local newsroom and evening news magazine, where I was interviewed) and local press. 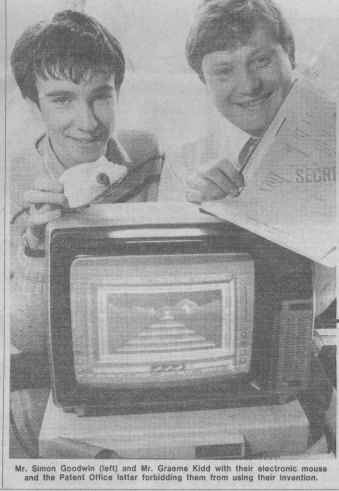 By the time Venture was aired the Ministry had climbed down, lifting the ban, and Graeme and I popped up in the large-circulation Birmingham Evening Mail to tell the story, wave the prototype, and get a screen-shot of the game I was touting at the time in print for good measure - this Atari program was developed for Quicksilva from the previous year's TV series titles. A Mouse is a device for conveying input to a computer. Our Digital Mouse is a low-cost 'pointing device' designed for use with Home Computers - a role previously dominated by the joystick. The Digital Mouse is a joystick replacement. (1) It has a more ergonomic design. The Mouse can easily be operated with one hand on any approximately flat surface - the fire or selection buttons are conveniently placed under the fingertips for left or right-handed users. Conventional joysticks require two handed operation and a pulling rather than pushing action - in effect, the user is expected to pull the joystick's components apart. (2) The Mouse is more durable than a joystick - it has been designed to withstand rough handling, and the weight of the user is transferred though its body, not through a fragile stem or stick. (3) Accuracy is greater with the Mouse, particularly when selecting diagonals. Movements needed are typically smaller and more 'positive', in that it is easy to tell when a particular direction has been chosen. 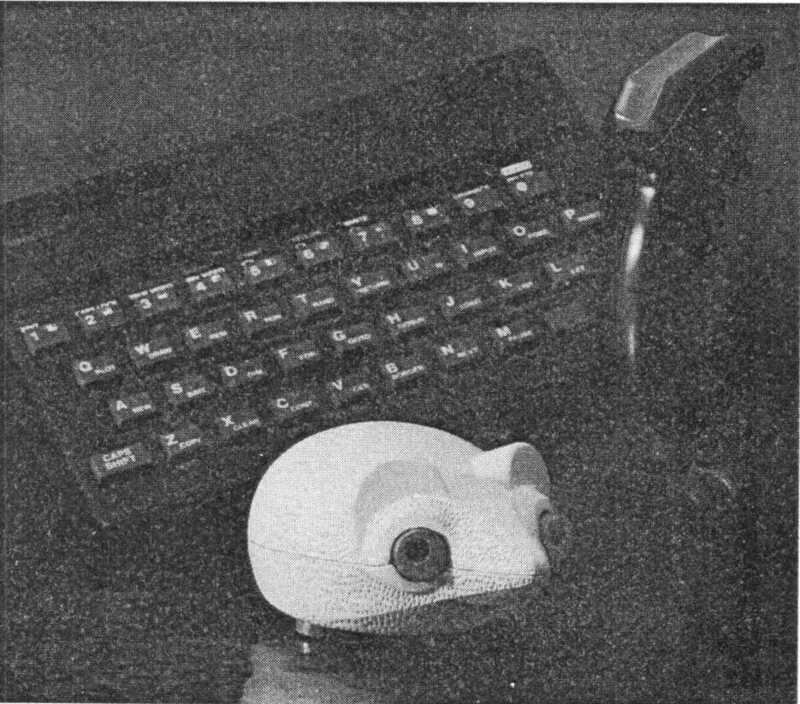 The Digital Mouse is solidly made from tough ABS plastic or a similar material - ABS is the plastic traditionally used to make telephones. We tested the prototype by standing a 14 stone designer on top of it, with no ill effects. The colour of the body, eyes and feet are manufacturing options. Any colour, including transparent, is possible. The Mouse has four spring-loaded 'legs' which detect and transmit eight-directional information to the computer. A durable nylon spring is used to reinforce the brass switch contacts. The output signal is routed via a standard 9-pin D type plug. Virtually all personal computers support this connector directly or via low-cost adapters. Other connectors are available as a manufacturing option. The two spring-loaded fire buttons may be wired to give independent or equivalent signals. This is a manufacturing option. 'Auto-fire' action (as on some joysticks) is also an option, as is cable-less remote control. A switch, made up to resemble the tooth of the Mouse, reverses the indication given by forward and backward movements of the mouse. This is useful when using software that produces a 'cockpit', as opposed to a 'map', view. By this time I'd reached the age of 21, back at University for my final year, popping into the Computing Science department sporadically, rather more diligently editing the news in our student newspaper, writing the Computer Answers column for best-selling micro monthly Personal Computer World, and developing as my graduation thesis a language compiler later published in half a dozen versions by Digital Precision and HiSoft Ltd. for Sinclair and Commodore micros, then bundled with Atari Corporation's Mega ST computers. The latter two activities, plus other magazine and programming projects, both kept me busy and proved remunerative, so I became less involved with the mouse. Fund raising for production was handled by Graeme alongside his many other get-rich schemes. As many UK entrepreneurs have found this is a tough country in which to try to raise venture finance for manufacturing. Barely half of the capital needed to put the mouse into production was ever pledged, mainly by Crash magazine publisher Newsfield which Graeme and I worked for subsequently. 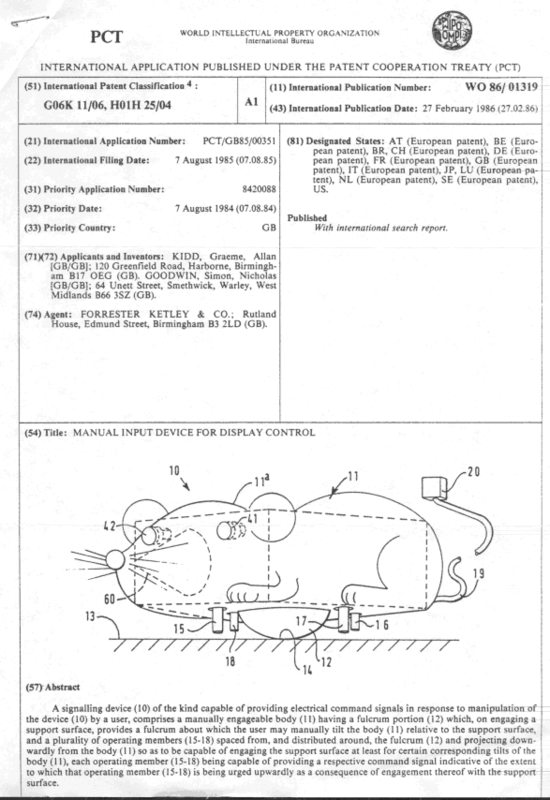 The patents were allowed to lapse in 1990, by which time more sophisticated quadrature-sensing mice were standard features bundled with the new breed of home computers, the Commodore Amiga and Atari ST, and interfaces for those were available for most older micros. We'd missed the boat, not helped by the MoD ban, but I found it a fascinating process. 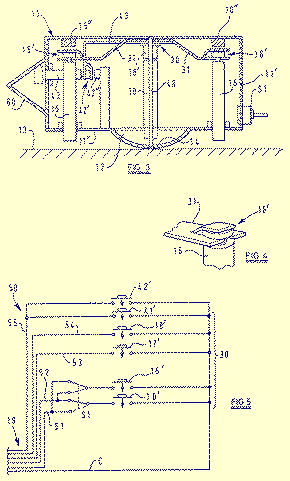 The experience of co-writing this simple patent was crucial in my recommendation that Codemasters should patent my far more sophisticated Dance Factory invention  decades later. The hassle of production steered my own product development towards software to repurpose existing mass-market electronics - epitomised by the game console development model - rather than struggle to set up a real factory in the UK business environment. Two established companies, Spectravideo of Hong Kong and Cheetah Marketing, based in the UK with manufacture in Taiwan, did release products which incorporated key ideas from our Digital Mouse. 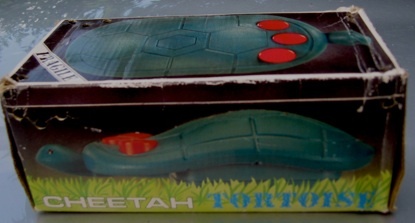 I expect the Quickshot IX controller (which looks like a trackball and works like a joystick) and the Cheetah Tortoise (note the breathing holes in the box!) saved some consumers the RSI of conventional joystick usage, and hope they made some money from the stickless joystick concept where Graeme and I could not. Inventing can be fun, packed with learning experiences, and typically involves lots of hard work after the initial flush of inspiration, but it's no easy path to riches. I earned not a penny from the whole saga; that's often the case, for inventors, and not something I much begrudge. It's not the reason I made the prototype, or followed it up. After all, Richard Feynman only got a dollar for his, and they were orders of magnitude more ingenious than my best. Though I think that aspect was important for Graeme, he too knew that many schemes must start for a few to succeed. Copyright © Simon N Goodwin 2011, 2012, updated December 2015. 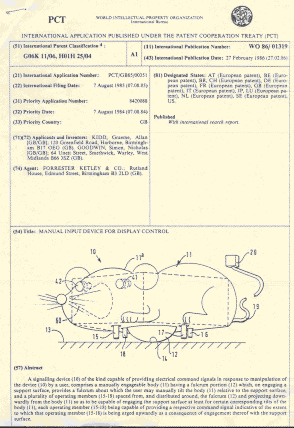 UK patent GB2163903 "command signalling device"
 European Patent EP0190249 "manual input device for display control"